Rickie Fowler shot a 7-under 65 on Thursday at the 117th U.S. Open to grab the lead. Dustin Johnson is in the clubhouse with a 3-over 75. 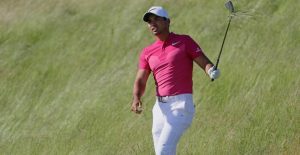 By midday in the first round of the United States Open, there were about 20 golfers under par. That was the most telling early signal that Thursday, for a few hours at least, might be different from most opening days of a U.S. Open. With temperatures around 80 degrees, little wind and the Erin Hills golf course softened by several rainstorms earlier in the week, scores were unusually low for those who teed off in the morning. The clubhouse leader was Rickie Fowler, whose seven-under-par 65 tied the lowest score to par recorded in a first round of the event. Jack Nicklaus and Tom Weiskopf were also seven under after the opening round of the 1980 Open. Among the golfers who teed off Thursday morning, Brian Harman, Tommy Fleetwood and Brooks Koepka were two strokes behind Fowler. Harman has won on the PGA Tour this year and has four other top-10 finishes. Fleetwood, a 26-year-old Englishman, is playing in just his second United States Open, but he has won one European Tour event this season, and has finished second and third in two others. Koepka, ranked 22nd in the world, has finished in the top 20 in his last three Opens. Patrick Reed was in fifth place with a four-under-par 68. Ernie Els, 47, a two-time United States Open winner, was tied for ninth after an opening 70. Not all the scores were low. Billy Horschel hooked his opening tee shot into a pond, knocked his golf ball back and forth across the first green and then three-putted. He walked to the second tee at Erin Hills four over par after making a 9. Things did get better, in a sense. Horschel finished with a seven-over-par 79. The defending champion, Dustin Johnson, shot a three-over 75. Fowler, who hit 12 of 14 fairways on Thursday, conceded the conditions favored those with the early tee times. “The conditions were more benign you just had to put the ball in the fairway and then find the green,” he said. “But based on the weather forecast, the guys who tee off in the afternoon will get the better conditions when they tee off in the morning on Friday. In advance of the coming rain, the winds were picking up as the first round wound its way to a conclusion late Thursday afternoon. Golf is experiencing a streak of first-time winners on its major championship circuit. The last six major winners had not won previously won one. Fowler could extend the streak. After his round on Thursday, he was asked if he considered it a compliment to be called the best player in the field not to have won a major. “I’ll take it as a compliment,” he replied. “There’s a lot of good players out here. It would be nice to get rid of that at some point.